Definition at line 280 of file DwarfDebug.h. Definition at line 318 of file DwarfDebug.cpp. References AllLinkageNames, llvm::DebugHandlerBase::Asm, computeAccelTableKind(), llvm::TargetOptions::DebuggerTuning, llvm::Default, DefaultLinkageNames, llvm::dwarf::DWARF_VERSION, DwarfLinkageNames, llvm::MCTargetOptions::DwarfVersion, llvm::Enable, llvm::GDB, GenerateDwarfTypeUnits, llvm::Module::getDwarfVersion(), llvm::MachineModuleInfo::getModule(), llvm::TargetMachine::getTargetTriple(), llvm::Triple::isNVPTX(), llvm::Triple::isOSBinFormatELF(), llvm::Triple::isPS4CPU(), llvm::LLDB, llvm::TargetOptions::MCOptions, llvm::DebugHandlerBase::MMI, llvm::TargetMachine::Options, llvm::AsmPrinter::OutStreamer, llvm::SCE, llvm::MCTargetOptions::SplitDwarfFile, llvm::AsmPrinter::TM, tuneForGDB(), tuneForLLDB(), tuneForSCE(), and ~DwarfDebug(). Definition at line 2785 of file DwarfDebug.cpp. Referenced by llvm::DwarfCompileUnit::addLocationAttribute(), and addSubprogramNames(). Definition at line 2797 of file DwarfDebug.cpp. Definition at line 2790 of file DwarfDebug.cpp. Definition at line 2802 of file DwarfDebug.cpp. Referenced by llvm::DwarfUnit::applySubprogramAttributes(), and llvm::DwarfUnit::updateAcceleratorTables(). Definition at line 610 of file DwarfDebug.h. Referenced by llvm::DwarfCompileUnit::addLabelAddress(), llvm::DwarfCompileUnit::addLocalLabelAddress(), and llvm::DwarfCompileUnit::addLocationAttribute(). Add a DIE to the set of types that we're going to pull into type units. Definition at line 2667 of file DwarfDebug.cpp. References llvm::DwarfUnit::addDIETypeSignature(), llvm::AccelTable< DataT >::addName(), llvm::Apple, llvm::DebugHandlerBase::Asm, llvm::Default, llvm::Dwarf, getAccelTableKind(), getDwarfVersion(), llvm::DwarfStringPool::getEntry(), llvm::DICompileUnit::getNameTableKind(), llvm::DwarfFile::getStringPool(), llvm::DIE::getUnitDie(), llvm::MipsISD::Ins, llvm_unreachable, makeTypeSignature(), llvm::None, llvm::DICompileUnit::None, llvm::Ref, useSegmentedStringOffsetsTable(), and useSplitDwarf(). Definition at line 2811 of file DwarfDebug.cpp. Definition at line 426 of file DwarfDebug.cpp. References addAccelName(), addAccelObjC(), llvm::Apple, llvm::DwarfFile::getAbstractSPDies(), getAccelTableKind(), llvm::DIScope::getName(), llvm::DICompileUnit::getNameTableKind(), getObjCClassCategory(), getObjCMethodName(), isObjCClass(), llvm::DICompileUnit::None, and useAllLinkageNames(). Referenced by llvm::DwarfCompileUnit::constructInlinedScopeDIE(), and llvm::DwarfCompileUnit::updateSubprogramScopeDIE(). Definition at line 1552 of file DwarfDebug.cpp. References llvm::DebugHandlerBase::Asm, assert(), emitInitialLocDirective(), llvm::LexicalScopes::empty(), llvm::LexicalScopes::getCurrentFunctionScope(), llvm::MachineFunction::getFunction(), llvm::LexicalScope::getScopeNode(), llvm::Function::getSubprogram(), llvm::DwarfCompileUnit::getUniqueID(), llvm::DebugHandlerBase::LScopes, llvm::DICompileUnit::NoDebug, llvm::AsmPrinter::OutStreamer, and llvm::DebugHandlerBase::PrologEndLoc. Definition at line 1406 of file DwarfDebug.cpp. References llvm::DebugHandlerBase::Asm, assert(), llvm::DebugHandlerBase::beginInstruction(), llvm::DebugHandlerBase::CurMI, DWARF2_FLAG_IS_STMT, DWARF2_FLAG_PROLOGUE_END, llvm::Enable, llvm::MachineInstr::FrameSetup, llvm::DebugLoc::getCol(), llvm::MachineInstr::getDebugLoc(), llvm::MachineInstr::getFlag(), llvm::MachineFunction::getFunction(), llvm::DebugLoc::getLine(), llvm::MachineInstr::getMF(), llvm::MachineInstr::getParent(), llvm::DebugLoc::getScope(), llvm::Function::getSubprogram(), llvm::MachineInstr::hasDelaySlot(), llvm::MachineInstr::isCall(), llvm::MachineInstr::isMetaInstruction(), llvm::DICompileUnit::NoDebug, llvm::AsmPrinter::OutStreamer, llvm::DebugHandlerBase::PrevInstBB, llvm::DebugHandlerBase::PrevInstLoc, llvm::DebugHandlerBase::PrevLabel, llvm::DebugHandlerBase::PrologEndLoc, and llvm::DebugHandlerBase::requestLabelAfterInsn(). Emit all Dwarf sections that should come prior to the content. Definition at line 711 of file DwarfDebug.cpp. References llvm::DwarfCompileUnit::addAddrTableBase(), llvm::DwarfUnit::addString(), llvm::DwarfUnit::addUInt(), llvm::any_of(), llvm::DebugHandlerBase::Asm, assert(), llvm::DIE::children(), llvm::DIEHash::computeCUSignature(), llvm::DwarfFile::computeSizeAndOffsets(), llvm::DwarfUnit::constructContainingTypeDIEs(), llvm::AsmPrinter::createTempSymbol(), llvm::Module::debug_compile_units(), llvm::Module::debug_compile_units_begin(), llvm::Module::debug_compile_units_end(), DisableDebugInfoPrinting, llvm::empty(), llvm::DwarfCompileUnit::finishEntityDefinition(), llvm::DwarfCompileUnit::finishSubprogramDefinition(), for(), forBothCUs(), llvm::MCSection::getBeginSymbol(), llvm::DwarfUnit::getCUNode(), llvm::MCObjectFileInfo::getDwarfMacinfoSection(), llvm::MCObjectFileInfo::getDwarfRangesSection(), getDwarfVersion(), llvm::DebugLocStream::getLists(), llvm::MachineModuleInfo::getModule(), llvm::AsmPrinter::getObjFileLowering(), llvm::DwarfCompileUnit::getOrCreateGlobalVariableDIE(), llvm::DwarfUnit::getOrCreateTypeDIE(), llvm::DwarfFile::getRangeLists(), llvm::DwarfCompileUnit::getRanges(), llvm::DwarfCompileUnit::getSkeleton(), llvm::DIE::getUnitDie(), llvm::DIEUnit::getUnitDie(), llvm::Module::globals(), llvm::MachineModuleInfo::hasDebugInfo(), llvm::ARM_PROC::IE, llvm::detail::DenseSetImpl< ValueT, DenseMap< ValueT, detail::DenseSetEmpty, ValueInfoT, detail::DenseSetPair< ValueT > >, ValueInfoT >::insert(), llvm::DICompileUnit::isDebugDirectivesOnly(), llvm::AddressPool::isEmpty(), llvm::TargetOptions::MCOptions, llvm::DebugHandlerBase::MMI, llvm::DICompileUnit::NoDebug, llvm::TargetMachine::Options, P, llvm::MachineModuleInfo::setDebugInfoAvailability(), llvm::DwarfCompileUnit::setDWOId(), llvm::AddressPool::setLabel(), llvm::DwarfFile::setLoclistsTableBaseSym(), llvm::DwarfFile::setRnglistsTableBaseSym(), sortGlobalExprs(), llvm::MCTargetOptions::SplitDwarfFile, T, llvm::DwarfCompileUnit::takeRanges(), llvm::TimePassesIsEnabled, llvm::AsmPrinter::TM, useRangesSection(), useSegmentedStringOffsetsTable(), and useSplitDwarf(). This can be used to handle an entry that's going to be emitted into the debug loc section. Definition at line 1901 of file DwarfDebug.cpp. Referenced by llvm::DIEHash::addSLEB128(), and emitDebugLocEntryLocation(). Emit the location for a debug loc entry, including the size header. Definition at line 2010 of file DwarfDebug.cpp. References llvm::DebugHandlerBase::Asm, emitDebugLocEntry(), llvm::AsmPrinter::emitInt16(), llvm::AsmPrinter::EmitULEB128(), llvm::DebugLocStream::getBytes(), getDwarfVersion(), llvm::max(), and llvm::AsmPrinter::OutStreamer. Definition at line 1532 of file DwarfDebug.cpp. References llvm::DebugHandlerBase::Asm, DWARF2_FLAG_IS_STMT, findPrologueEndLoc(), getDwarfVersion(), llvm::MachineFunction::getFunction(), llvm::Function::getSubprogram(), and llvm::DebugHandlerBase::PrologEndLoc. Referenced by beginFunctionImpl(), and llvm::AsmPrinter::emitInitialRawDwarfLocDirective(). Gather and emit post-function debug information. Definition at line 1585 of file DwarfDebug.cpp. References llvm::DebugHandlerBase::Asm, assert(), llvm::DwarfFile::emitAbbrevs(), llvm::emitAppleAccelTable(), llvm::emitDWARF5AccelTable(), llvm::DwarfStringPool::emitStringOffsetsTableHeader(), llvm::DwarfFile::emitUnits(), llvm::empty(), llvm::LexicalScopes::getAbstractScopesList(), llvm::MCSection::getBeginSymbol(), llvm::LexicalScopes::getCurrentFunctionScope(), llvm::MCObjectFileInfo::getDwarfAbbrevSection(), llvm::MCObjectFileInfo::getDwarfAccelNamespaceSection(), llvm::MCObjectFileInfo::getDwarfAccelNamesSection(), llvm::MCObjectFileInfo::getDwarfAccelObjCSection(), llvm::MCObjectFileInfo::getDwarfAccelTypesSection(), llvm::MCObjectFileInfo::getDwarfStrOffSection(), getDwarfVersion(), llvm::MachineFunction::getFunction(), llvm::AsmPrinter::getFunctionBegin(), llvm::AsmPrinter::getFunctionEnd(), llvm::AsmPrinter::getObjFileLowering(), llvm::DwarfFile::getScopeLabels(), llvm::LexicalScope::getScopeNode(), llvm::DwarfFile::getScopeVariables(), llvm::DwarfFile::getStringOffsetsStartSym(), llvm::DwarfFile::getStringPool(), llvm::Function::getSubprogram(), llvm::detail::DenseSetImpl< ValueT, DenseMap< ValueT, detail::DenseSetEmpty, ValueInfoT, detail::DenseSetPair< ValueT > >, ValueInfoT >::insert(), llvm::DICompileUnit::LineTablesOnly, llvm_unreachable, llvm::DebugHandlerBase::LScopes, llvm::AsmPrinter::OutStreamer, llvm::DebugHandlerBase::PrevLabel, llvm::ARMBuildAttrs::Section, and useSplitDwarf(). Emit all Dwarf sections that should come after the content. Definition at line 947 of file DwarfDebug.cpp. References llvm::Apple, assert(), llvm::DwarfCompileUnit::createBaseTypeDIEs(), llvm::DebugHandlerBase::CurMI, llvm::Default, llvm::Dwarf, GenerateARangeSection, getAccelTableKind(), llvm::MachineModuleInfo::hasDebugInfo(), llvm_unreachable, llvm::DebugHandlerBase::MMI, llvm::None, P, and useSplitDwarf(). Definition at line 645 of file DwarfDebug.h. Referenced by llvm::DwarfUnit::createTypeDIE(), and llvm::DwarfUnit::isShareableAcrossCUs(). Definition at line 650 of file DwarfDebug.h. Referenced by addAccelObjC(), addDwarfTypeUnitType(), addSubprogramNames(), and endModule(). Definition at line 700 of file DwarfDebug.h. Referenced by llvm::DwarfCompileUnit::addAddrTableBase(), llvm::DwarfCompileUnit::addLabelAddress(), llvm::DwarfCompileUnit::addLocationAttribute(), llvm::DwarfUnit::addOpAddress(), and emitRangeList(). Definition at line 712 of file DwarfDebug.h. Definition at line 680 of file DwarfDebug.h. Referenced by llvm::DIEHash::addSLEB128(), and llvm::DIELocList::EmitValue(). Definition at line 2807 of file DwarfDebug.cpp. Referenced by llvm::DwarfUnit::addBlock(), addDwarfTypeUnitType(), llvm::DwarfUnit::addFlag(), llvm::DwarfCompileUnit::addLabelAddress(), llvm::DwarfUnit::addLinkageName(), llvm::DwarfCompileUnit::addLocationList(), llvm::DwarfUnit::addLoclistsBase(), llvm::DwarfUnit::addOpAddress(), llvm::DwarfUnit::addRnglistsBase(), llvm::DwarfCompileUnit::addScopeRangeList(), llvm::DwarfUnit::addSectionDelta(), llvm::DwarfUnit::addSectionLabel(), llvm::DwarfUnit::addSectionOffset(), beginModule(), llvm::DwarfUnit::constructContainingTypeDIEs(), llvm::DwarfCompileUnit::constructInlinedScopeDIE(), llvm::DwarfUnit::emitCommonHeader(), emitDebugLocEntryLocation(), emitDebugRangesImpl(), llvm::DwarfCompileUnit::emitHeader(), emitInitialLocDirective(), emitLoclistsTableHeader(), emitRangeList(), endFunctionImpl(), llvm::DwarfUnit::getDwarfVersion(), llvm::DwarfCompileUnit::getHeaderSize(), llvm::DwarfUnit::getHeaderSize(), llvm::DwarfUnit::getMD5AsBytes(), llvm::DwarfUnit::getOrCreateTypeDIE(), hasVectorBeenPadded(), and llvm::DwarfUnit::~DwarfUnit(). Definition at line 676 of file DwarfDebug.h. Definition at line 2815 of file DwarfDebug.cpp. A helper function to check whether the DIE for a given Scope is going to be null. Check whether we should create a DIE for the given Scope, return true if we don't create a DIE (the corresponding DIE is null). Definition at line 460 of file DwarfDebug.cpp. References llvm::SmallVectorBase::empty(), llvm::SmallVectorTemplateCommon< T, typename >::front(), llvm::DebugHandlerBase::getLabelAfterInsn(), llvm::LexicalScope::getRanges(), llvm::LexicalScope::isAbstractScope(), and llvm::SmallVectorBase::size(). Referenced by llvm::DwarfCompileUnit::constructLexicalScopeDIE(), and llvm::DwarfCompileUnit::constructScopeDIE(). Definition at line 719 of file DwarfDebug.h. References llvm::DenseMapBase< DenseMap< KeyT, ValueT, KeyInfoT, BucketT >, KeyT, ValueT, KeyInfoT, BucketT >::lookup(). Referenced by llvm::DwarfCompileUnit::constructAbstractSubprogramScopeDIE(), and llvm::emitDWARF5AccelTable(). Definition at line 720 of file DwarfDebug.h. Perform an MD5 checksum of Identifier and return the lower 64 bits. Definition at line 2656 of file DwarfDebug.cpp. References llvm::MD5::final(), llvm::MD5::MD5Result::high(), and llvm::MD5::update(). Definition at line 693 of file DwarfDebug.h. 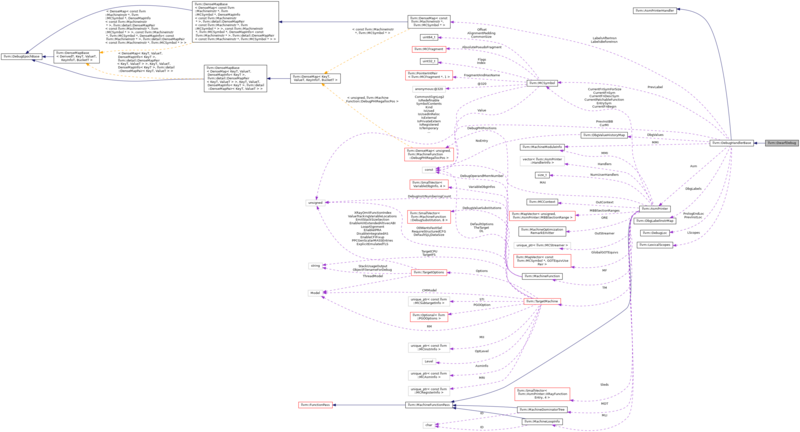 Referenced by llvm::DwarfCompileUnit::getOrCreateGlobalVariableDIE(), and isUnsignedDIType(). Definition at line 677 of file DwarfDebug.h. Definition at line 614 of file DwarfDebug.h. Definition at line 484 of file DwarfDebug.cpp. References llvm::DIE::addChild(), llvm::DwarfUnit::addFlag(), llvm::DwarfUnit::addString(), llvm::DwarfUnit::addStringOffsetsStart(), llvm::DwarfUnit::addUInt(), llvm::DwarfFile::addUnit(), llvm::DebugHandlerBase::Asm, assert(), llvm::DwarfCompileUnit::constructAbstractSubprogramScopeDIE(), llvm::DwarfCompileUnit::constructCallSiteEntryDIE(), llvm::DwarfCompileUnit::constructImportedEntityDIE(), D, llvm::dbgs(), llvm::dyn_cast(), llvm::StringRef::empty(), llvm::DIScope::getDirectory(), llvm::DICompileUnit::getDWOId(), llvm::DIScope::getFile(), llvm::DIScope::getFilename(), llvm::DICompileUnit::getFlags(), llvm::DebugHandlerBase::getFunctionLocalOffsetAfterInsn(), llvm::MachineOperand::getGlobal(), llvm::DICompileUnit::getImportedEntities(), llvm::LexicalScope::getInlinedAt(), llvm::TargetSubtargetInfo::getInstrInfo(), llvm::Value::getName(), llvm::DwarfUnit::getOrCreateContextDIE(), llvm::DICompileUnit::getProducer(), llvm::DICompileUnit::getRuntimeVersion(), llvm::DIImportedEntity::getScope(), llvm::LexicalScope::getScopeNode(), llvm::DIScope::getSource(), llvm::DICompileUnit::getSourceLanguage(), llvm::DICompileUnit::getSplitDebugFilename(), llvm::Function::getSubprogram(), llvm::MachineFunction::getSubtarget(), llvm::DIEUnit::getUnitDie(), llvm::DwarfFile::getUnits(), llvm::DwarfCompileUnit::hasDwarfPubSections(), llvm::ARM_PROC::IE, llvm::DwarfCompileUnit::initStmtList(), llvm::LexicalScope::isAbstractScope(), llvm::MachineOperand::isGlobal(), llvm::DICompileUnit::isOptimized(), llvm::TargetInstrInfo::isTailCall(), LLVM_DEBUG, MI, N, SplitDwarfCrossCuReferences, llvm::StringRef::str(), TII, useAppleExtensionAttributes(), useSegmentedStringOffsetsTable(), and useSplitDwarf(). Definition at line 1576 of file DwarfDebug.cpp. If not, we still might emit certain cases. Definition at line 620 of file DwarfDebug.h. Referenced by llvm::DwarfCompileUnit::addLocationAttribute(), addSubprogramNames(), and llvm::DwarfUnit::applySubprogramDefinitionAttributes(). 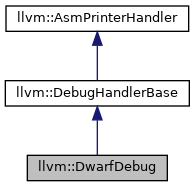 Definition at line 652 of file DwarfDebug.h. Referenced by llvm::DwarfUnit::applySubprogramAttributes(), shareAcrossDWOCUs(), and llvm::DwarfCompileUnit::updateSubprogramScopeDIE(). Definition at line 628 of file DwarfDebug.h. Returns whether to use DW_OP_GNU_push_tls_address, instead of the standard DW_OP_form_tls_address opcode. Definition at line 624 of file DwarfDebug.h. Definition at line 631 of file DwarfDebug.h. Definition at line 642 of file DwarfDebug.h. Definition at line 634 of file DwarfDebug.h. Referenced by llvm::DwarfCompileUnit::attachRangesOrLowHighPC(), beginModule(), and emitDebugRangesImpl(). Definition at line 637 of file DwarfDebug.h. Referenced by computeIndexValue(), llvm::DwarfUnit::emitCommonHeader(), llvm::DwarfCompileUnit::emitHeader(), and llvm::DwarfCompileUnit::initStmtList(). Returns whether to generate a string offsets table with (possibly shared) contributions from each CU and type unit. This implies the use of DW_FORM_strx* indirect references with DWARF v5 and beyond. Note that DW_FORM_GNU_str_index is also an indirect reference, but it is used with a pre-DWARF v5 implementation of split DWARF sections, which uses a monolithic string offsets table. Definition at line 666 of file DwarfDebug.h. Referenced by addDwarfTypeUnitType(), beginModule(), computeIndexValue(), emitDebugRangesImpl(), shareAcrossDWOCUs(), and llvm::DwarfUnit::useSegmentedStringOffsetsTable(). Returns whether or not to change the current debug info for the split dwarf proposal support. Definition at line 658 of file DwarfDebug.h. Referenced by addDwarfTypeUnitType(), llvm::DwarfCompileUnit::addLabelAddress(), llvm::DwarfCompileUnit::addLocationAttribute(), llvm::DwarfUnit::addOpAddress(), llvm::DwarfUnit::addSectionLabel(), llvm::DwarfCompileUnit::applySubprogramAttributesToDefinition(), beginModule(), computeIndexValue(), emitDebugRangesImpl(), llvm::emitDWARF5AccelTable(), llvm::DwarfCompileUnit::emitHeader(), llvm::DwarfTypeUnit::emitHeader(), emitLoclistsTableHeader(), llvm::DIELocList::EmitValue(), endFunctionImpl(), endModule(), llvm::DwarfCompileUnit::getHeaderSize(), llvm::DwarfCompileUnit::includeMinimalInlineScopes(), and shareAcrossDWOCUs().